With spring comes barbecue season, and nothing christens the old BBQ quite like a juicy burger. If you’re looking to welcome the season and still keep your health goals in check, one of these delicious burger alternatives just might do the trick. Mashed beans are a great substitute for ground beef because they stick together and form patties very easily. They are also an excellent source of protein, so you won’t be missing out in that department. All types of beans — lentils, black beans, chickpeas — can be used to create delicious vegetarian burgers. For some added fun, consider adding nuts in with the beans for an exciting crunch to your usual old patty. Many vegetables also go well in vegetarian burgers, so don’t be afraid to experiment with incorporating your favourite diced veggies. This is a wonderfully healthy and delicious option. If you’re feeling creative, then why not welcome spring by incorporating some seafood into your old grilling routine? Salmon burgers are tangy and delicious and bring with them a sense of the freshness of the season. This particular fish is a wonderful source of omega-3 fatty acids, as well as several vitamins and minerals such as calcium and iron. For the perfect combination of burger and sauce, try creating your very own salmon burgers with cilantro mayonnaise. True, your tastebuds will know this version isn’t ground beef right from the get-go — but they’ll also be tantalized in a whole new way. These wide mushrooms are loaded with vitamins and minerals and have a meaty texture that makes them perfect for grilling and enjoying on a bun. You can dress them up with your traditional burger toppings or top them off with mozzarella and red pepper for an extra yummy treat. If you can’t do without the flavour of ground meat, that’s okay too. You can still make burgers a healthy choice by opting for lean ground turkey instead of the usual artery-clogging beef variety. According to the Cooking Nook, one serving of turkey provides more than half your body’s daily protein requirement, with half the fat of beef and 30 per cent fewer calories. And you’re still working with ground meat, so the burger will have an almost identical texture to what you are used to. 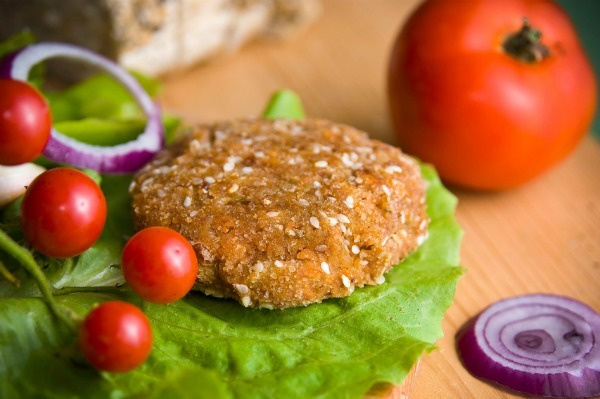 You can simply sub ground turkey into your favourite old burger recipe or, for something new, try creating a Greek turkey burger that everyone is sure to love. Whether you’re looking for something vegetarian, low-carb or simply with more food value than your typical burger, never forget that there are loads of non-beef burgers out there for you to enjoy this barbecue season!